Generic Sensor API: Generic Sensor API defines a framework for exposing sensor data to the Open Web Platform in a consistent way. It does so by defining a blueprint for writing specifications of concrete sensors along with an abstract Sensor interface that can be extended to accommodate different sensor types. Ambient Light Sensor: Ambient Light Sensor defines a concrete sensor interface to monitor the ambient light level or illuminance of the device’s environment. Accelerometer: Accelerometer defines Accelerometer, LinearAccelerationSensor and GravitySensor interfaces for obtaining information about acceleration applied to the X, Y and Z axis of a device that hosts the sensor. 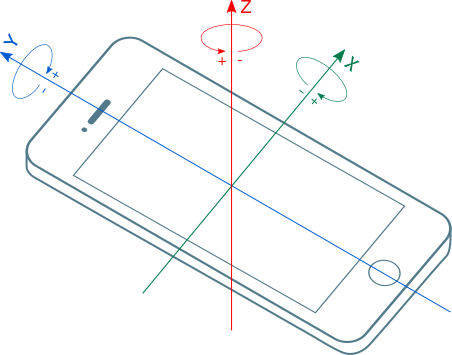 Gyroscope: Gyroscope defines a concrete sensor interface to monitor the rate of rotation around the device’s local three primary axes. Magnetometer: Magnetometer defines a concrete sensor interface to measure magnetic field in the X, Y and Z axis. Orientation Sensor: Orientation Sensor defines a base orientation sensor interface and concrete sensor subclasses to monitor the device’s physical orientation in relation to a stationary three dimensional Cartesian coordinate system.